Congratulations to the national team of Colombia! 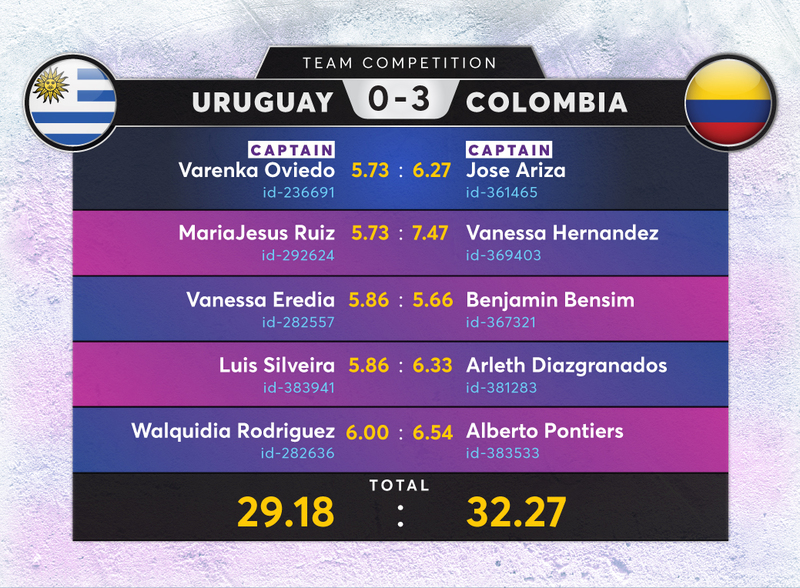 The second day was much more productive for Uruguay team. Results got better, and the team captain Varenka Oviedo could even win the Colombian leader Jose Ariza! On the first day of the competition, the team of Colombia showed its power - all the participants of this team scored a coefficient higher than 5 points. Uruguay fell behind its opponent by 4.61 points - this is not the best start, but this is not the end... Uruguay, go! You still have 4 days. We announce the new participants of the Team Competition tournament - they are the teams of Colombia and Uruguay. South American derby promises to be really hot! Attention! Duration of the tournament is prolonged up to 5 debate days. Two teams, of 5 people each, take part in the tournament. Each team has its leader who forms the team. He can invite the users only from his own country. At the beginning, leaders will be chosen by DB Advisors. How does the competition take place? Teams participate in daily debates for several days. After the completion of a debate day, we sum up the coefficients of the participants in each team and compare the results with the ones of the other team. The team with the highest summative coefficient receives one point. The winner will be the team scoring the highest points (two points) in three days. In the first version of the tournament, there should be 5 people in a team. The completion will be hold between the experienced countries, participants of which have been active users of our website for a long time, and the rookies who have only recently started their experience with emotional intelligence. Derby promises to be really hot!